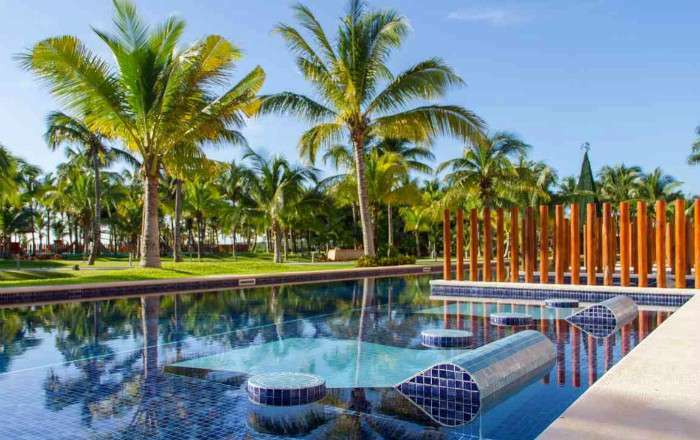 An incredible price for a all-inclusive 5-star beachfront resort in Riviera Maya. FREE Access to the Hydrotherapy Areas + FREE $1,000 Resort Credit Coupons + FREE Transfers, saving £809 per couple. Exclusive extras valid for travel completed 01 Nov 2018 - 31 Jul 2019. Prices for alternative days, dates, durations, and airports are available. Subject to Availability. The amount of $1,000 equals to the discounts given to the Guest that can only be applied on the purchase of different services and products within the Barceló Maya Beach Resort. The products and services listed are not part of the All-Inclusive. No extra deductions will be made from the bill at time of check-out. Resort Credits discounts cannot be exchanged for cash, neither totally nor partially and no unused portion thereof will be refunded. The resort credit discount coupons cannot be combined with any other discounts, offers or promotions. Per person price based on 2 adults sharing including return flights from London Gatwick, APD Tax, Fuel Charges, In-Flight Meals, 20kg Luggage Allowance, and 7 nights all-inclusive meal plan. Valid for stays of 7 nights or more. Regional and weekend flight supplements apply, price correct at the time of publication based on the lowest flight booking class seats. Low deposit available for select holiday packages. Low deposit not available for departures within 14 weeks of booking. Top-up deposit required 6 weeks after booking. Ask your Personal Travel Advisors for more details.